Last Tuesday I went on a cross country journey to the tiny village of Harby, in Leicstershire, along with Hachette picture book publicist, Becky, for a special visit to the winners of Reading Zone's nationwide picture book competition at Harby C of E Primary School. Upon our arrival at the school, Becky and I were given a warm welcome by Mrs Bye, the head teacher, and Mrs Jordan, the teacher of the winning class. Two pupils from the winning class took me and Becky on a really thorough tour of the 19th century school (later on, Becky and I still managed to get lost while hunting for the staff room). It's a tiny building, but it's a bit like the Tardis. It feels so spacious on the inside! 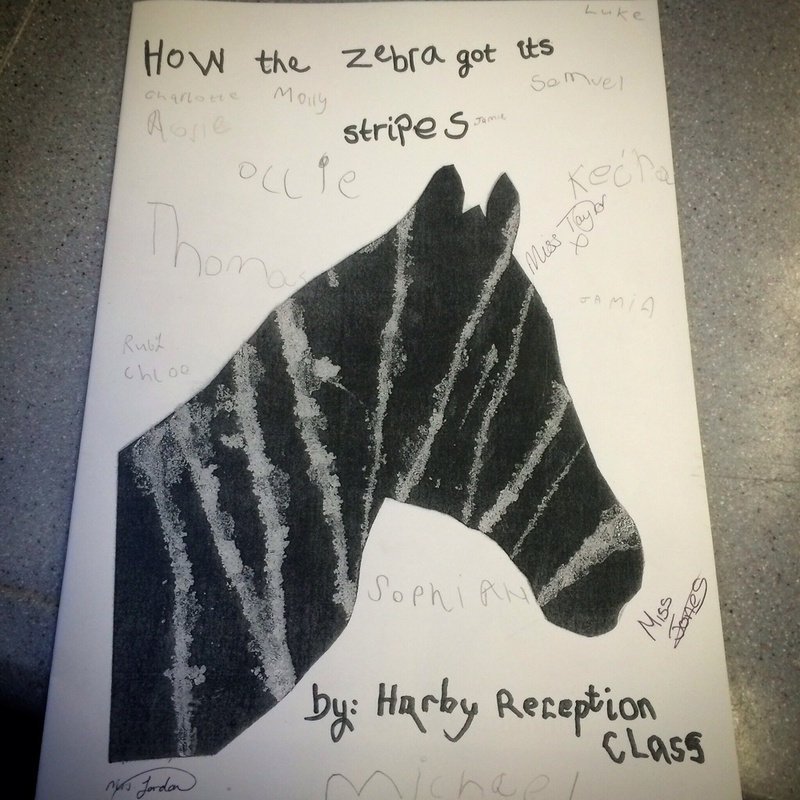 Before assembly, I had a good read of the winning class's picture book, 'How the Zebra got its Stripes', in all its fully printed picture book glory. The school had only just received their prize stack of printed books a couple of days earlier. 'How the Zebra Got its Stripes' is a magical picture book filled with bright splashes of life. It's rather innovative too. The story turns upside down halfway through. I love when books surprise you like that. I was really impressed. There are vibrant, Pollock-esque paint splats, striking black and white collages, hand prints, paper cut-outs and even photography. 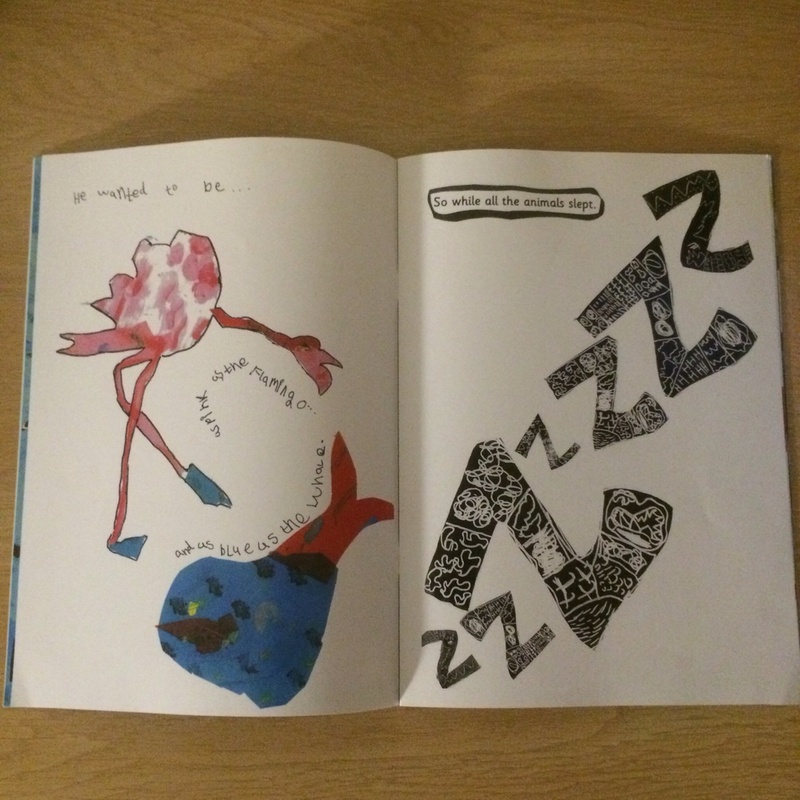 I have to say that I especially liked the clever ways in which the text was used on each page. You can tell that the children had lots of fun making this. Oh, and the dedications are the icing on the cake. I asked all of the pupils and teachers of the winning class to sign the book. They signed theirs, while I signed mine! For their morning assembly, I read 'The Queen's Hat'. The time flew by (no pun intended). We could have easily spent more time spotting things in the book. Showing pupils what didn't make it into 'The Queen's Hat'. Becky and I joined Reception for school lunch. While I was sat there eating, one of the pupils told me about a monkey story. For some reason I thought she was talking about a story she had made up. I said, "That's a great story. ", and she looked at me with a screwed up you're-not-listening-to-me-properly face and said, "YOU wrote it!" At which point she pulled 'Betty Goes Bananas' out from somewhere. In the afternoon, I taught the younger ones how to draw a corgi and Big Ben and whirlwinds and hurricanes. The whirlwinds and hurricanes were their idea. The corgi fying with a cape was my idea. 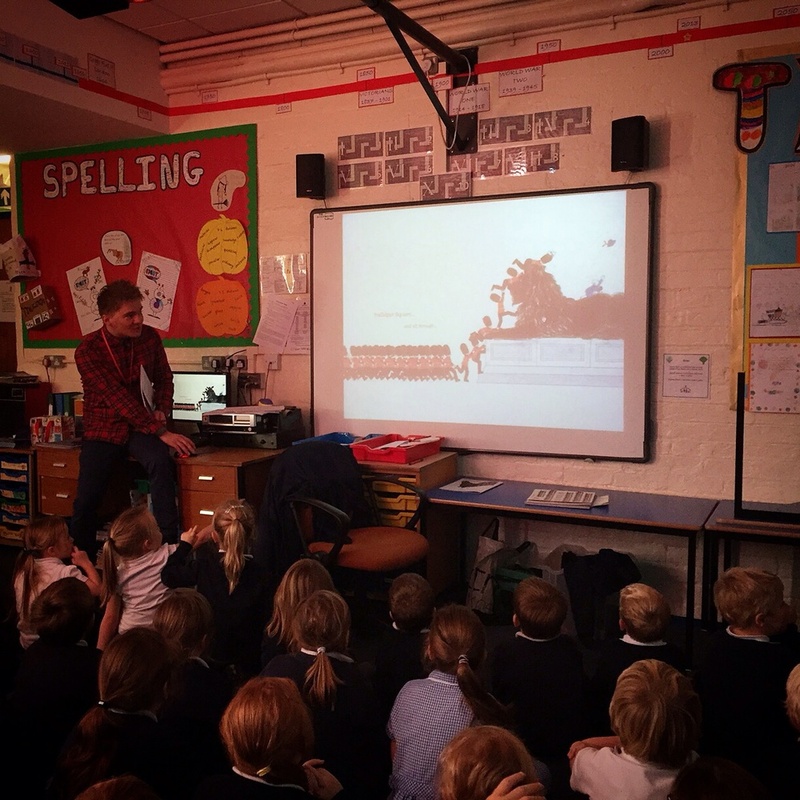 For the older children I gave a presentation about how I became a picture book maker, and I answered lots of questions. To end the day, we all drew Mr Panda from my next book, 'Please Mr Panda'. It was great seeing all of their artwork, and I don't just mean corgis, bananas and pandas. I mean all THEIR artwork on the walls. All of the pictures of things they've been learning about. All of the letters, numbers, words, animals, models, mobiles, storyboards, paintings. It was inspirational. The whole day was inspirational. I'll wrap this blog post up by saying a huge thank you to the Harby teachers. Both Becky and I really enjoyed our day there. It's not every day you get to visit a winning school. You're all superstars! 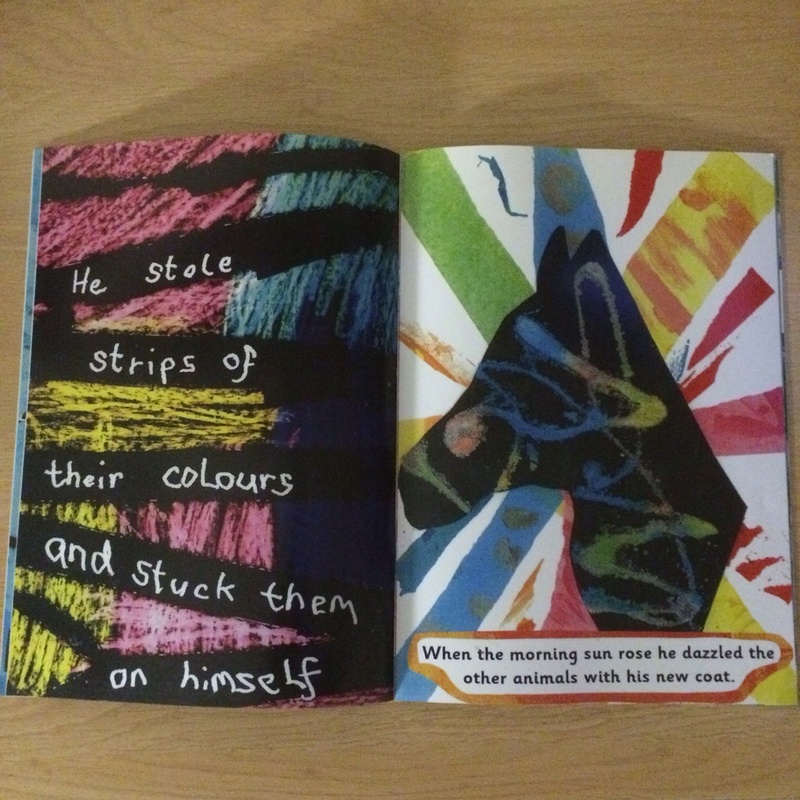 You can download 'How the Zebra Got its Stripes' HERE!